Koh Bon diving, Similans, Thailand. Popular for Manta Rays. Others would say that diving Richelieu Rock diving isn’t suitable for divers who have limited experience, and that novice divers feel overwhelmed there. 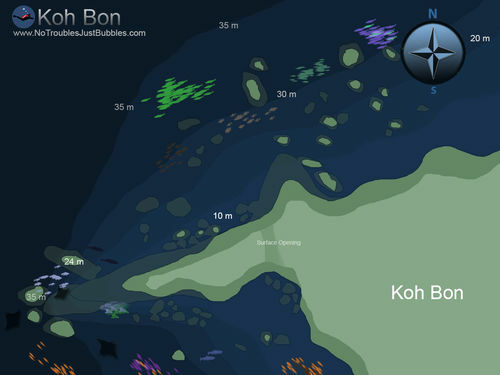 However, Koh Bon diving can claim to be the best dive site in Thailand for all levels of scuba diver. It’s suitable for new divers, but also has plenty of exciting marine life and topography to keep experienced and even professional divers happy. Koh Bon is famous for its common Manta Ray (Manta alfredi) sightings, but even without them it’s a very good dive site for everyone. On any day of the diving season, there are always liveaboard diving boats at Koh Bon. Some visit for two dives and then move on, while others may spend the night moored at Koh Bon. Koh Bon is located far away from the mainland or any other islands. Therefore, it is not really affected by pollution but can be prone to some currents. There is no development at all on Koh Bon, and there is no beach. Snorkelling is possible in the bay, but 95% of visitors come to scuba dive at Koh Bon Ridge, or Koh Bon Pinnacle. Liveaboard diving boats come to Koh Bon every day, and the only reason for their visits is scuba diving. Due to the remote location, almost all liveaboard boats which visit Koh Bon stay for at least two dives. Divers at the vertical wall Koh BonThe Ridge (sometimes referred to as Reef or Bay) is a great place for safe scuba diving for all levels of diver. There is shallow water in a protected bay, and lots of life to see at all depths. There is also a 33m. vertical wall that is home to hundreds of species. This area is easy enough for all divers to enjoy, but also exciting & interesting enough for experienced divers. Liveaboard diving boats and even day trip boats can drop divers off and then wait, usually using the island as protection from any wind or waves. 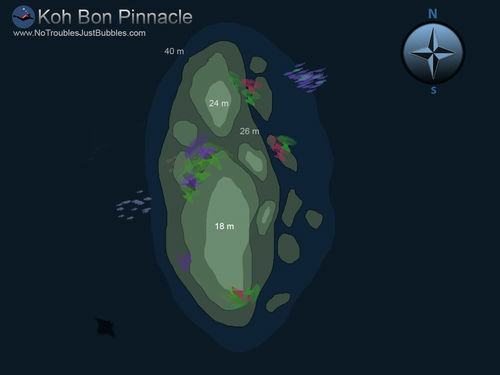 Koh Bon Pinnacle is only for experienced divers because its shallowest point is at a depth of 18 metres. There is actually another pinnacle a bit deeper. The sandy bottom around the pinnacles is deeper than most recreational scuba divers can descend to, which means that it’s a big area and there’s plenty to see. However, it’s worth pointing out that a long and boring safety stop is usually necessary, unless divers want a long swim across to The Ridge. Manta Ray Manta alfredi at Koh BonManta Rays are not the only exciting or special species for scuba divers to see at Koh Bon. Although Whale Sharks (Rhincodon typus) are seen from time to time, Koh Bon isn’t well known for them. However, there are plenty of bony fish, sharks & rays, invertebrates and reptiles which would be considered special at most other dive sites. The trouble is, so many divers come to Koh Bon in the hope of seeing a Manta Ray that they don’t pay too much attention to something smaller. 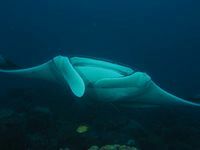 Also, divers at Koh Bon spend much of their time looking out into the blue hoping to be the first to notice the wingtips of these gentle filter-feeding giants. A clever diver would do well to focus on the smaller marine life around the reef, and really enjoy the dive site for what it is. Then, when a Manta Ray or something else large and special comes, it’s certain that other divers or the Divemaster guide will make sure everyone knows. This is because most experienced divers and all the staff have notification systems, such as tank bangers. A couple of taps on a tank and everyone underwater will hear it instantly. So, unless you’re so competitive that you want to be the first diver to notice something large, it’s better to spend your time enjoying the reef’s smaller species. 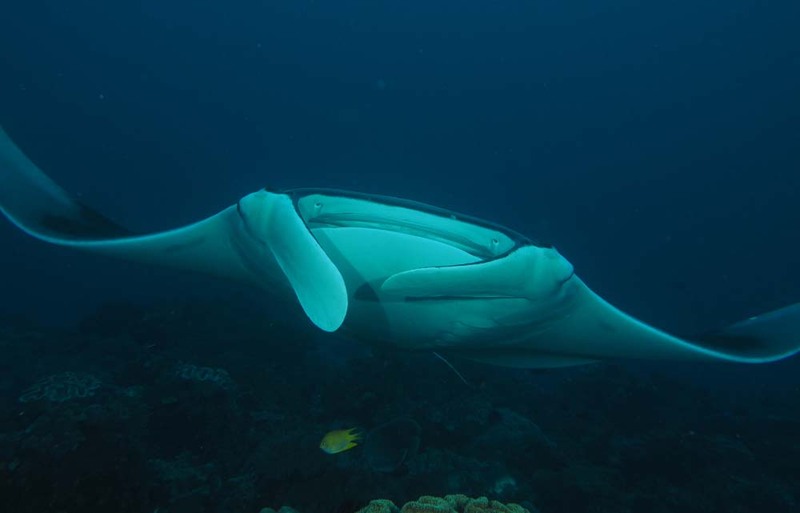 And don’t forget that there are many dives at Koh Bon when Manta Rays are nowhere to be seen. Why waste up to an hour each dive floating around looking out for something that’s not there? A couple of things are important when diving at Koh Bon, and these are normally connected to each other. Firstly, it’s quite common for divers to feel that when they see a Manta Ray they need to spend as much time as possible with or near it. Maybe they’re trying to get the perfect photograph, or just want to get the most out of the experience. Like almost all wild animals, Manta Rays don’t want to be followed or hassled, but they can stay around calm humans. Manta Rays are known to enjoy the bubbles of divers and they appear to play in the company of calm divers who aren’t racing around the reef. However, they also have a reputation for ‘leading’ annoying divers out into the deep blue water, and then disappearing; often to return to the group of calm divers. If you’re the type of diver who chases after fish, sharks & rays, you could easily find yourself in deep water, away from your group, and with no Manta Ray to see. Also, when enjoying an exciting dive with something special to watch or photograph, it’s very easy to forget about decompression limits, your depth, or even your air supply. Don’t forget to dive safely at all times. In addition to the marine life at Koh Bon causing potential problems for divers who aren’t paying attention, the currents can be almost non-existent in the bay or down at the Pinnacle, but may be medium to strong out of these protected areas. 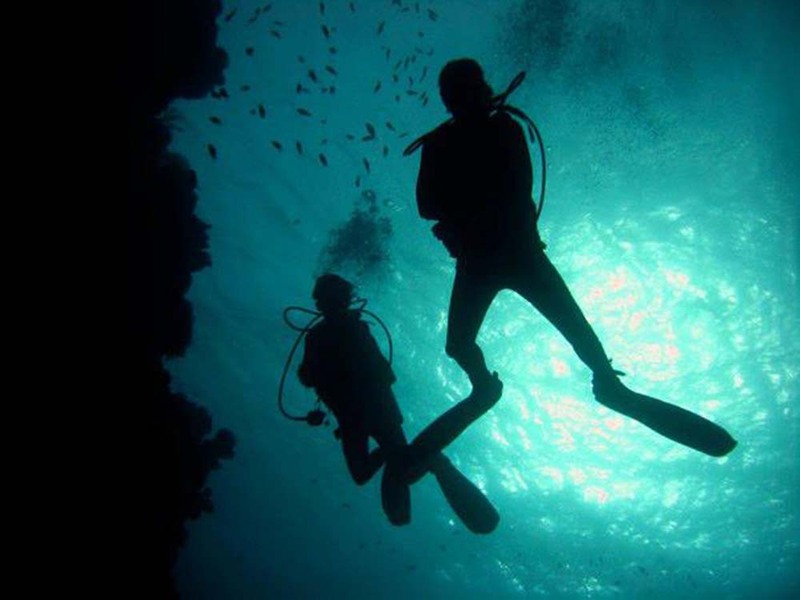 It’s important to always stay with, follow, and obey your dive guide, especially at Koh Bon.